11 Jan 2018 Washington, D.C.
Democrats are urged in the memo to not support any 2018 spending bills this month that does not include a DACA amnesty where illegal aliens are given a pathway to U.S. citizenship, saying later that it will “jeopardize” elections for Democrats. Democrats should refuse to offer any votes for Republican spending bills that do not offer a fix for Dreamers and instead appropriate funds to deport them. Political allegiances are made in moments like these. If Democrats don’t try to doeverything in their power to defend Dreamers, that will jeopardize Democrats’ electoralchances in 2018 and beyond. In short, the next few weeks will tell us a lot about theDemocratic Party and its long-term electoral prospects. 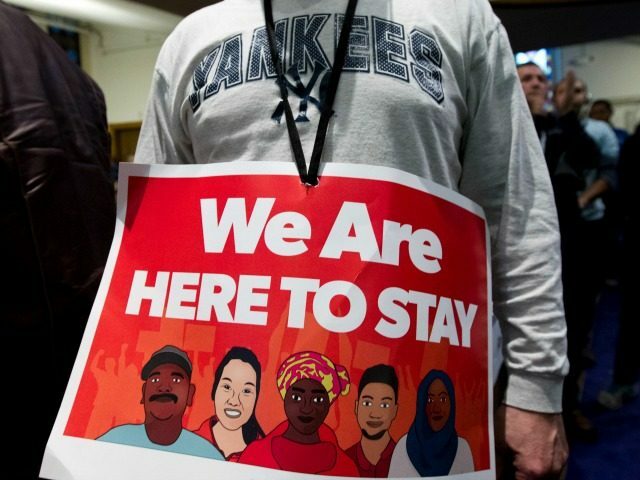 The leaked memo comes as the Trump administration has endorsed a DACA amnesty plan that trades legalizing the nearly 800,000 illegal aliens in exchange for mandatory E-Verify, which bars employers from hiring illegal aliens, ending chain migration, where newly naturalized citizens can bring an unlimited number of foreign relatives to the U.S. with them, ending the Diversity Visa Lottery program, which randomly imports 50,000 foreign nationals a year, and authorizing the construction of a wall along the U.S.-Mexico border. The Pew Research Center found in 2012 that a plurality of Hispanic illegal aliens are Democrats, while only 4 percent said they identified with the Republican Party.